Today's post is the 7th in the series and features responses from Lee Grant and Tom Williams of Timemachine Magazine. Previously published are responses from Lavalette, Michael Itkoff of Daylight Magazine, Ray Potes of Hamburger Eyes Photo Magazine, Jeffrey Ladd of Errata Editions, Barry W. Hughes of SuperMassiveBlackHole and Bryan Formhals of LPV Magazine. fototazo: What gave you the drive to create an online photography magazine and what is the backstory on how you formed? Lee Grant and Tom Williams: The impetus came from a love of photography and from seeing the impressive amount of strong photographic work that was being made in various parts of Australia - a very big country - and of course, the rest of the world. We wanted to share work that spoke to us, moved us, that we felt was important - and that we could connect with an audience that might otherwise not see it. What also intrigued us were the diverse ways of seeing and photographing in different parts of the world - and also the common ground. Our desire was to bring disparate projects and ideas together in one place, and to invite creative participation from everywhere. Both of us are also photographers. We think about photography obsessively, look at new images continually, and for years had nurtured a desire to establish such a magazine. Somehow we had never come into contact until recently, and when we did we almost immediately decided to initiate the project together. f: What are the particular or unique strengths about what Timemachine offers its readers? What separates it from other magazines? 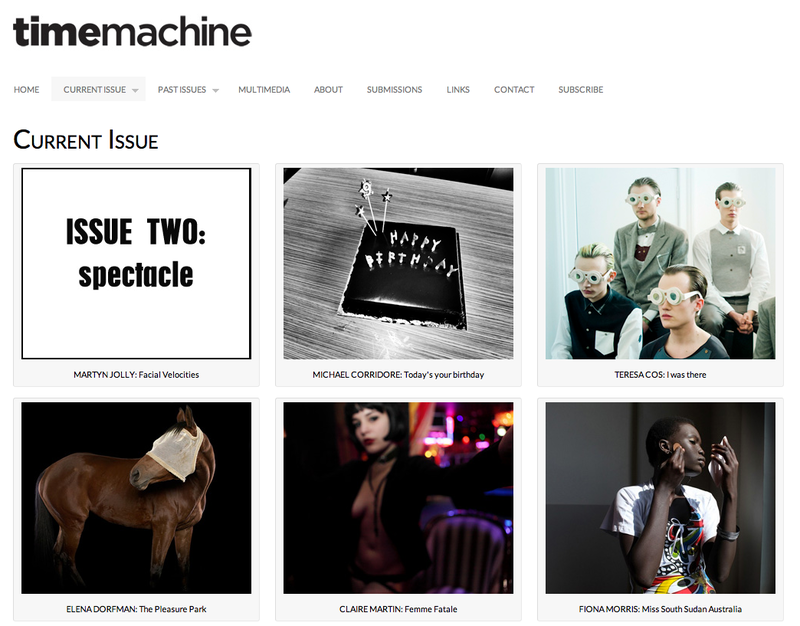 LG & TW: Timemachine is definitely a collaborative effort and a magazine collated by two photographers for photographers. In Australia there's been a real dearth of high quality photo-magazines that are not only informative but also feature extended bodies of work. We felt there wasn't much out there in terms showcasing Australian photography alongside international work either, so there's certainly potential for us to build a niche of interest here, particularly online as it's highly accessible. What separates us from other magazines is that we are image intensive and by design, very simple. It was important to us that the design is clean and simple and that the heart of the magazine is to highlight the commitment that a lot of photographers make to longer-term projects. Attention spans are pretty short these days, especially on the web, so to feature bigger projects in an accessible way and also in a way that can help get the photographers' work out to a wider audience was a primary goal. To date we've received submissions from every continent in the world, which we are rather proud of. f: How much different has the reality with Timemachine been from your expectations before launching the magazine? LG & TW: We are still young – finding our way and refining what our future might look like. There has certainly been a lot of excitement, which is fantastic. Many people are getting inspired by much of the work and the enthusiasm for engaging with these photographic projects has so far been as ardent as we'd hoped it might be. f: What is your process for deciding on a theme for the issue and how do you select what to publish from the submissions received? LG & TW: Themes can emerge from strains of work that interest us, especially when it seems that certain lines of enquiry, subjects or visual approaches are being investigated by a number of photographers. Or an idea might interest us, and we're curious to see how people interpret it, alongside bodies of work that we curate into an edition. Themes generate much discussion and we sometimes argue long and hard about what a particular word or idea really means - that's part of the fun. In some ways a theme is a starting point, and responses and interpretations can relate obliquely or directly. Our selections for publication are based primarily on visual strength. Originality and freshness is also a consideration, or at least the sense that work is born through an energetic visual and conceptual engagement. f: What has been your highlight in working with the magazine so far? LG & TW: Collaborating with brilliant and dedicated photographers has been really rewarding. In a number of cases we've had deep admiration for a photographer; and working with someone who has been an inspiration - and creating something new - is a little like the icing on the cake. Sharing the fruits of the collaboration with an international audience is also exciting in the sense that you've played a role in the representation of that person's work, curating and editing it alongside other, perhaps lesser known – but no less worthy – work. LG & TW: Editing and curating the work of other people sometimes makes you see your own work in a different light. With luck you come back to your own work with a fresh, critical eye. But the process of editing, organising and writing often makes you energised to get back to your own work and to pursue it with renewed dedication. Shifting your emphasis for a time away from your own work - a kind of sensory deprivation - makes you throw yourself back into it with intensified vigour. And of course the magazine work can deepen your understanding of what images can do, and that influences your own creative and observational processes. f: What are your next steps with Timemachine? Where would you like it to be in five years? LG & TW: We're looking at making print editions. The web is superb in terms of communicating with people and reaching an audience - Timemachine was born on the Internet and of course this incarnation will remain - but the photograph in physical form, the print, the photobook and magazine - present and preserve work in a different way. In five years we'd like to be very much involved with the ideas and discourse surrounding photography; publishing fresh work that has impact on the eye and the mind (and the heart); commissioning incisive contemporary writing on photography and its concerns and providing a platform for new emerging photographers in particular.